You might be surprised to discover that a freight forwarder doesn’t actually move shipments itself. Instead, it makes arrangements with shipping companies on your behalf. A bit like a travel agent that arranges transport for people, a freight forwarder arranges transportation of shipments, which might lead you to wonder ‘why not just go to the shipping line directly?’. 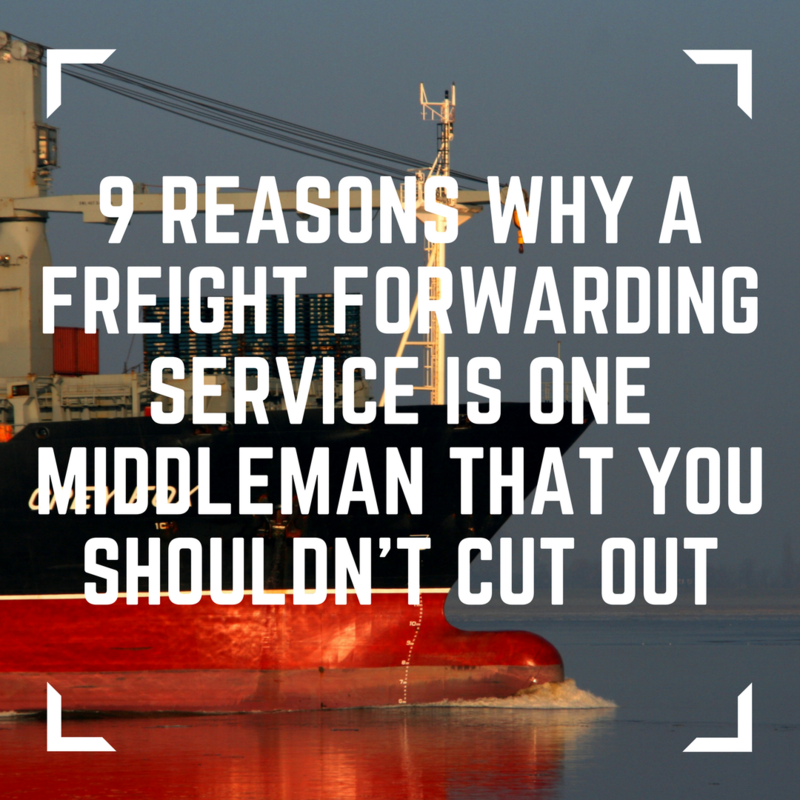 Here are nine reasons why a freight forwarding service is one middleman that you shouldn’t cut out. The main reason most businesses decide to use a freight forwarder to organise their shipping is to cut down the hassle factor. There are numerous ways in which a freight forwarder reduces the stress and hassle involved in shipping, including completing documentation, organising each element of the shipping process and providing a single point of contact, which we’ll cover in further detail below. Fundamentally though, using a freight forwarder will free up your time and resources, allowing you to focus on other aspects of your business. Import and export procedures can be tricky to navigate, especially as different countries have different rules and regulations. A freight forwarder will ensure that all the relevant documents, licenses and fee payments are in place, so you can feel confident that your goods will clear customs – and arrive at their destination on time! A good freight forwarder will have a network of carriers to choose between, plus the experience and knowledge to advise you on the quickest or most economical route – or method and mode of transportation – for your cargo. This gives you access to a full range of services offered by sea, air, road, rail & combinations of each to ensure cost-effective transit of goods in line with timescales required to meet deadlines. When going directly to a carrier, you’ll need to do this homework for yourself, and may be tied to one set of sailing schedules that won’t always best suit your requirements. Another benefit to a freight forwarder’s network is that it means a built-in back up when things don’t go according to plan. For example, if your shipment, quite literally, misses the boat, a freight forwarder is likely to be able to find an alternative, without having to wait for the next slot on that carrier’s sailing schedule. Many variables can delay a shipping process, and an experienced freight forwarder should be able to mitigate them. Freight forwarders should have good relationships with carriers, as well as enormous buying power – and both will enable a freight forwarder to negotiate a competitive deal on carrier costs. Similar economies of scale will apply if your freight forwarder is also organising your inland haulage and providing other add-on services. A Freight Forwarder will also have detailed knowledge in terms of carriers to use for specific trade lanes and routes that will be the most cost-effective. The facility to arrange import and export haulage is another key advantage of using a freight forwarding service. Freight forwarders can offer a seamless door to dock – then dock to door – service, if that’s what’s required. Or you can opt for the freight forwarder to oversee your shipment from warehouse to warehouse, and make your own arrangements for the delivery and collection of the cargo. As well as ensuring that all the appropriate paperwork is in order, a freight forwarder can assist your goods through customs in other ways. For example, a freight forwarder with AEO status will be subject to simplified customs processes that can speed and smooth the process. AEO shipments will also be given priority if selected for inspection, to minimise potential delays. Many freight forwarders offer add-on services, giving you the option of a truly end-to-end shipping solution. These services could include packaging and palletisation, product sourcing, shipment sorting, loading and unloading, and even destination delivery to your end customer. Choose the right freight forwarder, and you should benefit from excellent customer service and communication as standard – often with handy online tools to make it easier for you to order, track and document your shipments. Having a single point of contact for all elements of the shipping process is the ultimate hassle-free solution, and a freight forwarder can offer that, usually at a cost that delivers better value than a much more time-consuming DIY approach.